Yesterday, I had the pleasure of patronizing one of Charlotte's newest hair care salons, Revolution Ego. 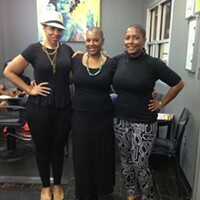 The Revolution Ego team (Tinesha, Kelly and Jessica) are three of the most friendly, fabulous stylists I've ever had the pleasure of spending a couple of hours with. My personal stylist, Tinesha, explained that their new salon, which has only been open for about a month, is an "Apple-inspired salon," which basically means that customers are invited to use the in-house iPads while being serviced. Even the music piped through the speaker system comes from the salon iPod. And the salon phone? You guessed it. The iPhone. They also offer free wi-fi should you choose to bring in your own laptop and my favorite, a complimentary glass of wine. Clients are not only able to relax and enjoy themselves, they can also surf the Internet, watch a movie while under the dryer or simply update their Twitter and Facebook statues, as I did for almost the entire duration my visit. What can I say, I'm a social media junkie. 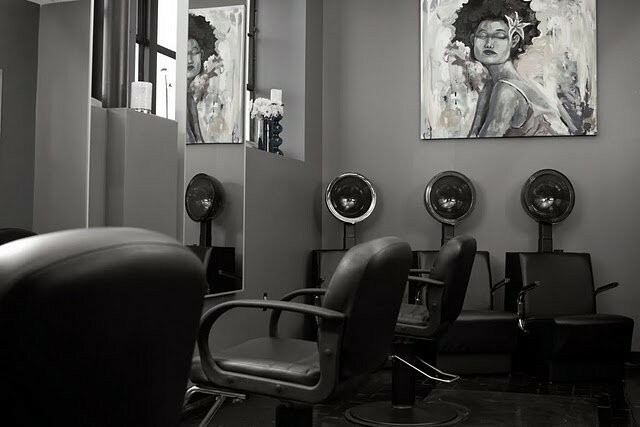 Revolution Ego is located inside the trailblazing Sola Salon in Dilworth at 2000 South Blvd., Suite 120. T. Strong is a TV personality, personal stylist and fashion journalist who contributes commentary on Creative Loafings Klepto blog in addition to writing for several other national media organizations. To learn more visit www.StyleMayvin.com or follow therealtstrong on Twitter.